Hawaii is a sublimely romantic destination any time of year, but when the holidays are over and the chill of January and February sets in here in the lower 48, our 50th state starts looking extra appealing. This winter, those warm temperatures and balmy breezes can be yours at a savings, thanks to several free-night resort promotions. Here’s a selection of what’s being offered – but be sure to book early for the best savings and availability. Marriott: Marriott’s five Hawaiian resorts are offering a “Sand Dollars” package with a free fourth or fifth night’s stay and daily breakfast for two. Rates drop to a low of $229/night (or $916 for four nights) at the Waikoloa Beach Marriott Resort & Spa on the Big Island of Hawaii, while they are $430/night (or $1,720 for four nights) at the Wailea Beach Marriott Resort & Spa on Maui (shown above left). 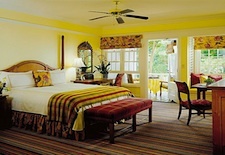 Seasons: With four properties in Hawaii and a “Stay Longer” promo offering third, fourth, fifth, or sixth nights free, there’s a setting and a room rate for nearly everyone looking for five-star travel to Hawaii throughout 2012. Most affordable is the beautiful Four Seasons Resort Lana’i, The Lodge at Koele (shown at right), a country estate-like property set on a stunning golf course on the quiet island of Lana’i, where a free third night brings the 3-night tally to $591 (or $197/night). “Stay Longer” rates at its serene beachfront sister property, Four Seasons Resort Lana’i at Manele Bay, fall to just $244/night (or $976 for a 4-night stay) – meaning you can spend a relaxing week here split between the two properties for $1,567. On Maui, the fifth night is free at the glamorous Four Seasons Resort Maui at Wailea, dropping rates to $476/per night (or $2,380 for a 5-night stay). And on the Big Island of Hawaii, rates at the recently renovated Four Seasons Resort Hualalai (shown at left), which enjoys a stunning setting in Kona, start at $646/night (or $3,876 for six nights). Starwood Hawaii: With Starwood’s “Sunsational Savings” special, you can get a third night free with daily breakfast for two and an upgrade (based on availability) at any of 10 Hawaiian properties, including the JW Marriott Ihilani Resort & Spa at Ko Olina on Oahu and the Westin Maui on Kaanapali Beach. Rates vary by property, but select dates in January and February are as low as $507 for three nights (at either the Sheraton Princess Kaiulani on Oahu or the Sheraton Keauhou Bay Resort & Spa on the Big Island). This offer is valid for stays through December 12, 2012. 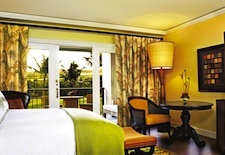 The Ritz-Carlton, Kapalua: With the “Island Paradise Luxury” package, you’ll get a fifth night free and daily buffet breakfast for two, starting at $399/night (totaling $1,596 for five nights, after the fifth night is adjusted at checkout) at The Ritz-Carlton, Kapalua. 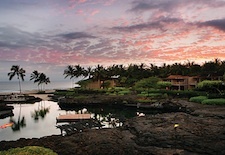 This beautiful property is nestled amid a beach and golf course on Maui (shown at left); rates are valid through December 15, 2012. See our Hawaii Travel Guide for more trip-planning information, then use our Travel Search price comparison tool to find the lowest rate on flights, hotels, packages, and more travel deals.